3 Great Guides To Help You Write Smoking Hot Copy That Is Almost Like Printing Money! It is hard to believe that I actually posted this the first time back in 2009. Wow! Holy Smokes Batman. A lot of things have changed since then, but one of them has not and that is Good Copy is key to your success online. More so now than ever! Thanks Alex Jeffreys for reminding me of this. If you are going to spend any time at all on making money online, spend it practicing writing good copy. That is the Key to online success period. Everything else is a distant second. And get this, you can learn to write good copy that sells. Heck if you have been a reader of mine for any length of time you know that I am freaking dyslexic, can’t spell for crap, and have ADD to boot. So, no excuses OK? If I can do it, you can do it! By the way, I have left this in its original form. The Start On Monday book is being re-done and will be available soon! If you want to improve your Profits, then here are 3 books and 1 report from Google that I am making available to your for Free. You should download and read them right away. These are my gift to you at absolutely no charge. You do not have to pay anything, nor sign up for another list. And I am also going to show you one of the books that you can get for free for 14 days read it, use it to make money, and if you don’t like it, you don’t have to pay for it. But if you do like it, you only pay for it after you have read it. How is that for an Author that thinks his material is good? This guy is one of my favorites and you will soon see why. The other 3 books and Report is yours for free forever. The technique of giving things away is called a reverse risk factor and it is very effective as you can imagine but, most people are afraid to use it. Which is good because it makes it even more effective for those that do. Why Am I Giving These To You? The reason why I am giving them to you is because I know that no matter where you are in your Business, they can have a huge impact on your profitability. Plus, it makes me feel good that I can give something of really high value that most people have never heard of before that can dramatically improve their life for the better. It is a complete kick in the pants. Plus, it is good Karma. If you are an old hat at the online game, or are just starting out, these can help you immensely. They will even help you in your Brick and Mortar business as well. You don’t have to sign up for an email list or anything as I mentioned. How is that for a change? Just click on them and save them and you can start reading them right away. They are all in PDF format except for the last one. 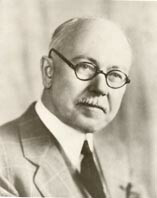 If you are trying to sell anything and have to write copy, Scientific Advertising by Claude Hopkins is a must read. It will dispel the myth about long copy that I see ignorantly bandied about these days. It shows you why it is good and how personal stories focused on your niche can really help sales. The things that he talks about in this book still work today. Most people don’t have a clue as to who he is or use his techniques. Now you don’t have to be one of them. 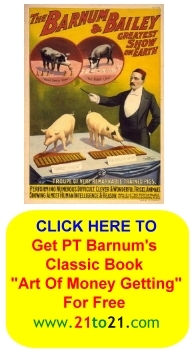 The Art Of Money Getting by PT Barnum is about as a good of a self-help book for business people there is. You will note that it is the basis for many of the new ones that have been written recently. 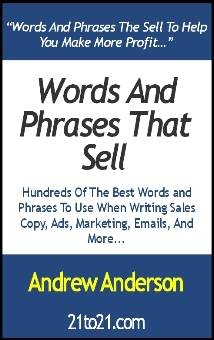 Words and Phrases that sell is a handy guide you can use when writing any sales copy that you have. Imagine having words that compel people to purchase your product at your fingertips! This one is edited by yours truly. Then there is the Google guide to Search Engine Optimization. Read it, learn it, use it and it will help with traffic to your site. Let me know what you think. I hope these help you as much as they have helped me. These are also the books are referred to in Start On Monday by Andrew “Easy” Anderson, hey that is me. 🙂 I have just released it and it is on building your business online and how to find a JOB if you must. You can check it out by clicking on the cover and you get to keep it for 14 days before you decide if you want to pay me for it. It has what I have learned in 20 years of being online, plus advice from some of the best Marketers in the world who have sold billions of dollars worth of products and services. Even if you don’t keep “Start On Monday” I suggest that you go snag it. There really is valuable information and resources in it. And you definitely need to get the other 3 books and reports. Remember, often times it is just one small idea that takes you to a whole new level in your business and life.